Injection of urethane resin into a parkade ceiling crack to make it water-tight. Simple and effective! When you have a leaking crack in your concrete wall, it's important to get a quality repair solution quickly. At Island Basement Systems, we use a urethane injection system designed to seal cracks. Our injection system for leaking concrete cracks is an excellent method of providing point repair sealing to concrete walls, ceilings, etc. We've provided thousands of feet of injection sealing in parkades, basements, ground floor suites, and more for property managers on Vancouver Island. If you're interested in parkade injection sealing, give us a call today at 1-855-206-4811 or click below! We offer free estimates in Victoria, Nanaimo, Saanich and nearby. Click here to download our concrete injection brochure and learn more about how our system can help solve your concrete leak issues. In a lot of parkades, the leak is a small nuisance above a car or parking stall. It is more effective to simply seal the crack, rather than to dig up the podium wall to expose the waterproofing. The injection system involves pumping in a liquid urethane resin into the concrete crack, which then creates a water-tight seal of the full thickness of the concrete wall or slab. It's not a coating or a patch, but a full depth waterproofing repair. We can also provide epoxy injection for structural repairs. Urethane resin is best suited for water sealing, while epoxy resin is best suited for structural work. Our injection system can usually be installed in one or two days, so there is minimal disruption to the building or parkade users. 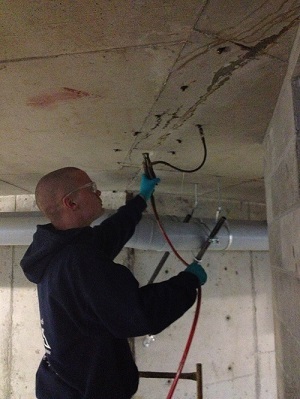 If you have water issues in a parkade or any other concrete surface, the experts at Island Basement Systems can help. Call us today to get a free estimate on parkade injection sealing. We offer all our waterproofing services in Victoria, Nanaimo, Saanich, Duncan, Campbell River, Langford, Courtenay, Port Alberni, Squamish, Esquimalt and throughout the surrounding areas.